Shifting performance and durability are greatly affected by the state of the chain and cables. Shifting needs to be adjusted perfectly to ensure the best performance. Best shifting performance is achieved with Shimano or KMC 10s/11s high-end chains. Use caution when shifting and riding. Make sure the chain is in the proper position when applying power. If the chain is not in the correct position the teeth can easily be damaged, and the chain will skip. The 0.6mm steel washer is only used with some longer hub bodies. 1. Lead time is up to 4 days. 2. Some items in rainbow/blue color are upon request, please contact us for the availability. 3. For other teeth ratios, please contact us. Recon alloy cassettes are CNC machined from a single piece of alloy. This increases the strength of the cassette compared with the more usual riveted type or mixed metal options that are available. 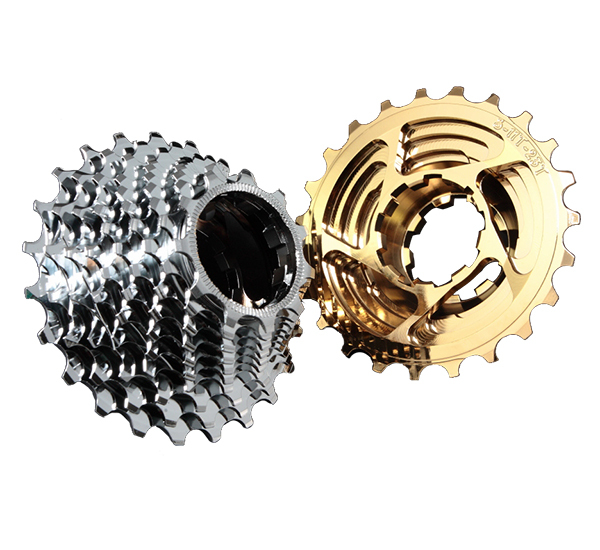 Shimano 11s: Recon aluminum cassettes feature eleven cogs machined from a single piece of aluminum. This produces offer lightest weight performance. Colorful options to meet high-end rider's special requirement. 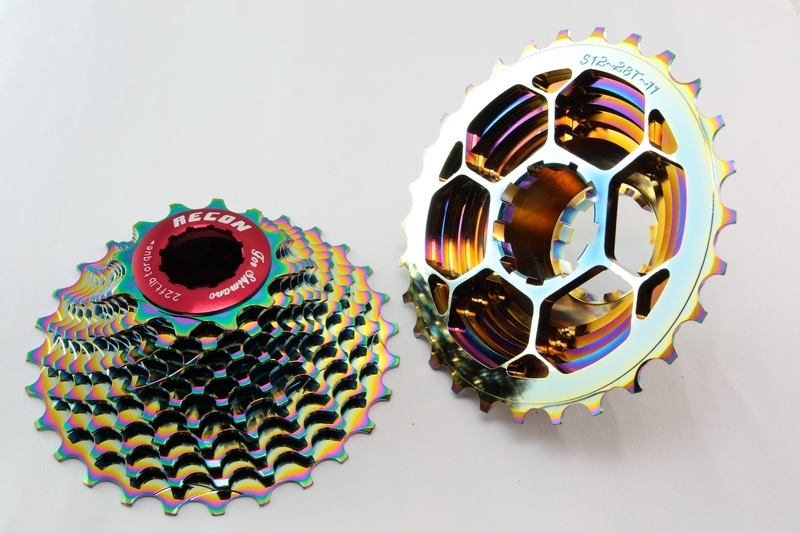 Multiple surface coatings give a unique appearance as well as increase cassette life. Cassette is very light. But the 11-tooth cog teeth were not aligned with the rest of the cogs, making it impossible to shift into the 11. The teeth on the 11 cog also very poorly shaped/roughly machine. Solved this by swapping with an 11 tooth cog from a shimano cassette. Shifting performance was also not great with dura ace chain. 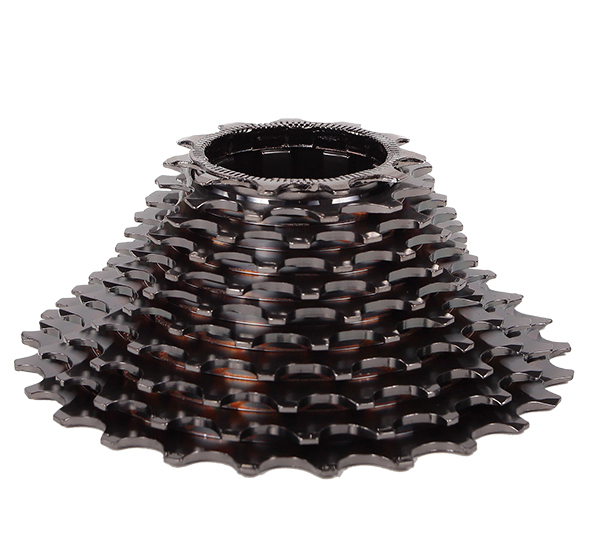 Product was better than expected, the item was light and strong, the color quality is by far better than those that cost more, i will be matching this up with my Campy super record and KMC chain 11 Speed, i will order more to replace on my other bikes. The dealer is very kind and precise. The product makes me pretty satisfied. Unfortunately I waited too much time to have it. Anyway my response is positive.